Dedicated to my endless search for easily alterable recipes to suit my dietary restrictions, especially the use of agave nectar instead of other sweeteners. Now (as of Nov. 2012) Gluten-Free! Eat what you love unless it threatens your health (or others, in the case of nuts). Use agave nectar instead of cane sugar, honey or corn syrup. This is a double review of sorts, although not so much a review of "The Perfect Scoop," as much as a confirmation of its recipes' flexibility. 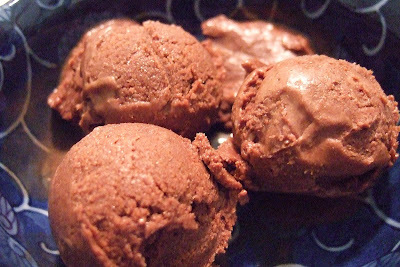 I was able to completely veganize and make a carob version of David Lebovitz's "Chocolate Ice Cream, Philadelphia Style" without much of a fuss at all. More importantly, I was able to produce a rich, fudgy carob ice cream that is just about the tastiest dessert I've had in a while. To do this, I used Mimicreme, a new non-soy, non-dairy cream substitute and almond milk for the dairy products. 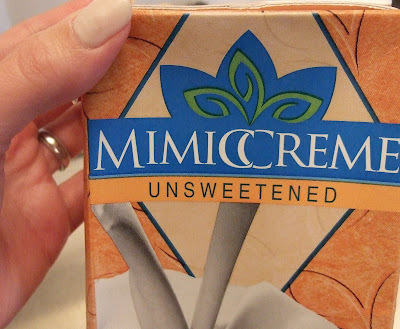 According to the Mimicreme site, the ingredients of the unsweetened version I used comprise: Purified Water, Almonds, Cashews, Bicarbonate Soda, Rice Starch, and Salt. 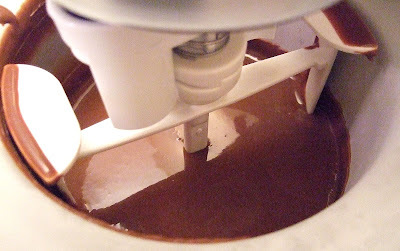 After trying this recipe, I have to say that for the ice cream trial, Mimicreme lived up to its promises. I plan to try it in different applications soon since I have a bit of it left over from this recipe. Any requests for trial recipes?? At first, I had my doubts about Mimicreme since it appeared so gray. But, I poured out some almond milk and saw that it was around the same hue, and I realized that the color would be completely carob-y when all was said and done. Thus, I stopped fretting about Mimicreme. 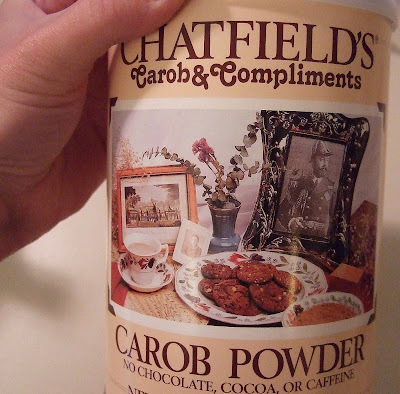 One of the primary reasons this recipe is so rich and fudgy is that it contains both carob powder (Dutch process cocoa in the original) as well as unsweetened carob chips. 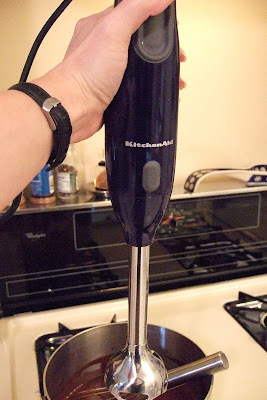 It's a pretty easy recipe, and the most time consuming part of it is waiting for the mixture to chill before freezing it in the ice cream maker. 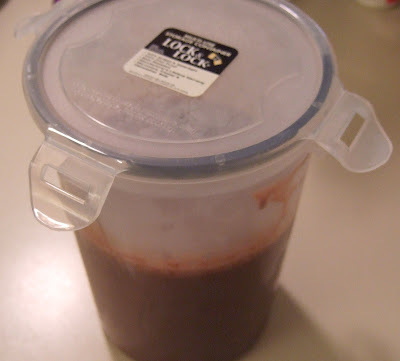 That always takes too long for my taste, so it's best to make it before going to bed, so you can chill your soon-to-be vegan frozen delight over night. 1. 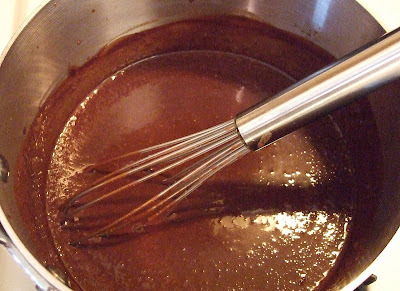 Whisk together the Mimicreme, carob powder, agave nectar, and salt in a large saucepan, heating until it just boils. 2. 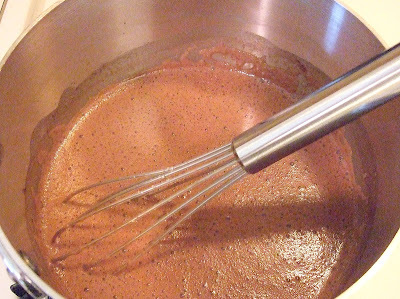 Cut the heat and whisk in the carob chips until they melt completely. Make sure you use a silicone spatula to get the carob that might stick in the corners of your saucepan. 3. 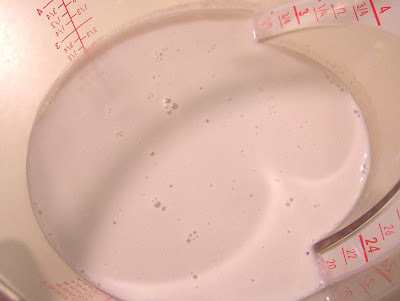 Whisk in the milk and vanilla until completely incorporated. 5. Chill the mixture for at least 6 hours. 6. Freeze according to your ice cream maker's instructions. Thanks a bunch, VeggieGirl! Love your blog. Such tasty looking dishes. wow, i really wish i had an ice cream maker after seeing this. it looks great!! Mmmmm Yum! I have a serious ice cream addiction at the moment (heading into summer in Australia). I wish we could get mimiccream over here :( Great recipe! I might have to see what I can come up with with some almonds and cashews. Thanks for stopping by, Vegetation. You might be able to ask the company for a sample, as I did. Who knows, that might spark an export business for them. thanks for the advice deb, im familiar with mimicreme but we dont have it here in greece. And the richest soy cream i have available here is soyatoo.ou ice cream looks fabulous! You're most welcome VW. I've never used soyatoo, but I'm not big on soy milk or soy creamers -- they give me a bit of an aftertaste. Mimicreme doesn't do that at all, and it really works just like cream. Neat stuff, especially since it comes from almonds! Unless otherwise specified, all photos, videos, and text displayed here are Copyright Debra Schiff 2005-2012.